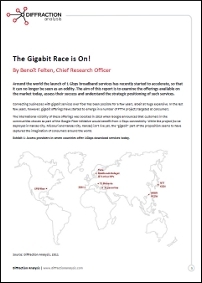 In this report entitled The Gigabit Race is On!, Benoit Felten analyzes the gigabit trend: around the world the launch of 1 Gbps broadband services has recently started to accelerate, so that it can no longer be seen as an oddity. An increasing number of telcos are indeed launching or at least considering the launch of 1 Gbps service. Who is going down the gigabit route, at what price, and more importantly why are they doing it? These are the questions that this report answers. It features detailed pricing comparisons between gigabit, 100 megabit and DSL-grade services in each of the markets examined.